If you’re looking for a long-term partner to help you take better care of your skin and look and feel your best, then we hope you will consider Celibre Medical Corporation. We have spent a considerable amount of resources building an arsenal of FDA-approved, state-of-the-art lasers and skincare devices coupled with the most knowledgeable, expertly skilled staff to provide you with the most up-to-date, effective and safe aesthetic, medical laser resurfacing treatments possible. We have a unique approach to our care that begins and ends with you…our patient. Your satisfaction, safety and comfort are at the heart of what we do here at Celibre Medical. You won’t find a one-size-fits all approach and you certainly can expect more than mediocre results. Our goal is to not only meet your high expectations, but to exceed them. We offer totally customized laser skincare resurfacing treatment that fits your specific needs, budget and lifestyle. Each of our devices is specifically designed to treat one, particular skin condition. Focusing our ability to treat a wide range of problems with several different, yet specific devices allows us to deliver the highest quality, most effective laser resurfacing treatments for whatever condition and skin type you have. Working with our expertly trained, highly skilled laser practitioners, we can create a laser treatment program that would be the most beneficial, safe and effective for you—whatever your needs are! The Quantel Medical Aramis is a single, 1540 nm wavelength laser specifically designed and FDA-approved to treat active acne, acne scars, stretch marks, and wrinkles. The 1540 nm wavelength is easily absorbed by fluid in the skin, stimulating the production of new collagen creating a smoother, more even skin tone and texture. The depth of its penetration also makes it ideal for shrinking the oil-producing sebaceous gland, one of the main causes of acne. The Palomar Q-Yag 5 is a dual, 1064 nm and 532 nm wavelength, q-switched laser that is specifically designed and FDA-approved to treat age spots, tattoos, birth marks and other pigmented lesions. While both wavelengths target melanin in the skin, each does so at a different level. This provides great flexibility in treating all skin types and all pigmentation problems regardless of their depth in the skin. The Sciton Profile laser is a dual, 1064 nm and 2940 nm wavelength laser. It is one of the newest, fastest and most advanced lasers in the world. 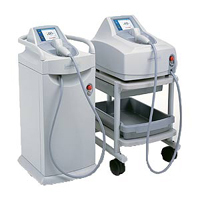 With the two, flexible wavelengths, it’s used safely and effectively for laser hair removal for all skin types, spider veins in all skin types and laser resurfacing for wrinkle reduction. It is also FDA-approved for all these indications. 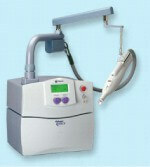 The Cynosure V-Star is one of the most advanced pulse dye lasers available. Its 585 nm wavelength is specifically designed and FDA-approved to treat vascular conditions such as Rosacea, stretch marks, spider veins and port wine stains. Its energy is readily absorbed by hemoglobin in the blood, which makes it ideal for eliminating the redness associated with these vascular conditions. The Lumenis LightSheer is a single, 810 nm wavelength laser specifically designed and FDA-approved to treat unwanted hair. 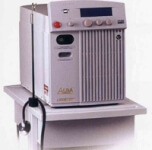 It is the gold standard for laser hair removal in light-skinned patients and is used for this purpose the world over. It prevents future hair growth by targeting the melanin at the base of the hair follicle. The heating of the melanin in the follicle causes damage to the blood vessel that feeds the follicle, which leads to its loss of ability to grow hair. The Laserscope Lyra-i is a single, 1064 nm wavelength laser specifically designed and FDA-approved to treat spider veins and unwanted hair. The Light Age Tat2 Eraser is a single, 755 nm wavelength, q-switched laser designed for the removal of pigmented lesions such as tattoos, birthmarks, permanent makeup and freckles. It is FDA-approved to treat all these conditions. The 755nm wavelength is easily absorbed by the colors associated with tattoos, birthmarks, sun spots, freckles and permanent makeup. It is ideally suited for the removal of more difficult tattoo colors such as green, light blue and orange, and it is also commonly used to treat more challenging birthmarks, such as Nevus of Ito and Nevus of Ota. The Medlite C6 is a dual, 1064 nm and 532 nm wavelength, q-switched laser specifically designed and FDA-approved to remove tattoos and other pigmented lesions such as freckles and birthmarks. These wavelengths are easily absorbed by melanin and hemoglobin in the skin. When melanin and hemoglobin absorb the energy from the laser, the tissue containing them is destroyed and new skin generated in its place will match the tone and texture of the surrounding skin. The Blu-U is a blue-light device made by Dusa Pharmaceuticals. It has a short-span 405 nm to 420 nm wavelength of high intensity light specifically designed and FDA-approved to treat acne. 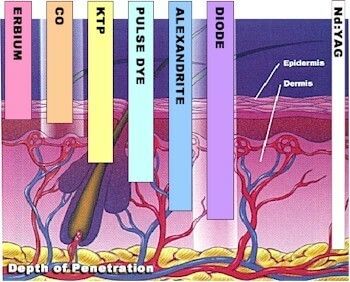 These wavelengths are used to kill acne-causing bacteria. It can also be used in combination with aminolevulinic acid (ALA) to shrink overactive sebaceous (oil) glands and helps with oily or acne prone skin. This procedure is called photodynamic therapy and is the most aggressive acne treatment program that we have at Celibre.